Okay, we really love shades of blue, but green should be your favorite color in budgeting. It's the color that says you've got money just waiting for a job to do. Sometimes your budget categories might be orange, red, or even gray. Each one is a signal for action—or for just sitting back and doing nothing right now. Red: Let's talk about that Groceries category. Red means immediate action is needed, because it represents cash overspending. Whether the spending happened with a checking/savings account or actual cash, some dollars have been spent that are still sitting in other categories. Move money to cover that overspending in order to trust your other Available amounts! Orange: Orange is up next, because it means the category is underfunded. Either you've overspent on a credit account, or you haven't budgeted enough for an upcoming transaction or goal. The icon tells you which of those applies, which we'll talk about in the next section. Green: It’s all good! Your Available amount is positive and enough to cover any upcoming scheduled transactions. If you have a goal for that category—you’re on track! Gray: Now, take a look at the Interest & Fees category. The Available amount is gray, because it's at zero and not underfunded. If there was an upcoming transaction and or an unmet goal, it would be orange. In the example above, there are three categories with an orange alert—each with a different symbol. What do they mean? Credit Card: The most urgent icon is the credit card with an exclamation mark, because it signals credit overspending. If you don’t budget more, it will become debt you need to pay off (by budgeting directly to the credit card payment category in a future month). 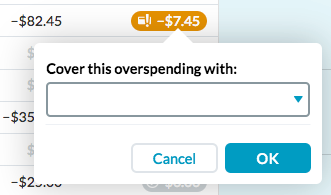 Click the Available amount and you can cover the overspending by moving money from another category. Calendar: The calendar icon means there isn't enough money for a transaction scheduled to happen later in the month. Using the Rent/Mortgage category as an example, when it's selected, the Inspector in the right sidebar shows the details for the upcoming, scheduled transaction in that category. Pie Chart: Ah, this delicious icon tells you whether or not you're on track to meet the goal you set for that category. When you see the pie on an orange category, you haven't a budgeted enough. In the Water category, we've budgeted $25, but need to budget another $25 in order to reach the Monthly Funding Goal of $50. If it's green—like the Transportation category—you're on track! And that check mark on the Internet category means the goal has been met. Success!